We all know that a circle has no beginning and no end. In Family Poems for Every Day of the Week / Poemas Familiares para cada día de la semana, everything is circular, everything is happening at the same time, and everyone is present at every moment. Each double-page spread contains an etymology of a particular day of the week. With Spanish predominating and English following, an individual poem stands alone and, at the same time, joins with the others to create a circle with the subliminal message that we are all related. 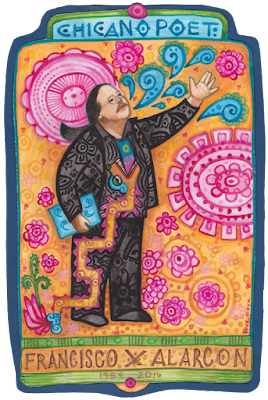 The life and work of the beloved, openly gay Chicano poet and educator, Francisco X. Alarcón, straddled three cultures. Creating work for children and adults in Nahuatl, Spanish and English, Alarcón passed on too soon—almost at the completion of this, his last book. Here, he returns to visit as a queer child, embodied in the book’s young narrator. Alone or in the company of family and friends, this child traverses the days of the week, displaying varying emotions: boredom, loneliness, thoughtfulness, joy—and, as did Alarcón, awareness of everyone and everything in the many circles of life. Rendering her full-bleed double-page spreads in watercolor, gouache and acrylic markers, González uses color as a form of spiritual expression. Her bright palette encompasses both warm and cool colors that dance together on every page, complementing rather than competing with each other. As well, lines are rounded and curved, and everywhere there are circles. In backgrounds, on clothing, in the patterns on the animales, and even on the faces of the elders, they display a connectedness of everything and everyone. Alarcón’s craft, as always, shines. On each spread he presents two or more poems in Spanish and English. Although he connects them to a particular day of the week, neither is a translation; rather, each has its own internal rhythm that reflects both the dreams and realities of the young narrator. 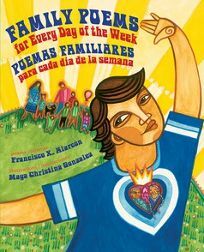 Family Poems for Every Day of the Week / Poems Familiares para cada día de la semana is both playful and serious, an LGBTQ-friendly children’s book that works with words and images in ways that encourage young readers and listeners—hablantes and English-speakers alike—to embrace who they are and how they see themselves. It’s full of verbal and visual communication that sends messages of love, comfort and belonging to everyone who is part of the great circle. There are far too few books for young people like this. One of my all-time favorites is González’s Call Me Tree / Llámame arbol (Children’s Book Press / Lee & Low, 2015). (See De Colores review here: http://decoloresreviews.blogspot.com/2015/02/call-me-tree-llamame-arbol.html). And Family Poems for Every Day of the Week / Poemas Familiares para cada día de la semana is another. It’s highly recommended.